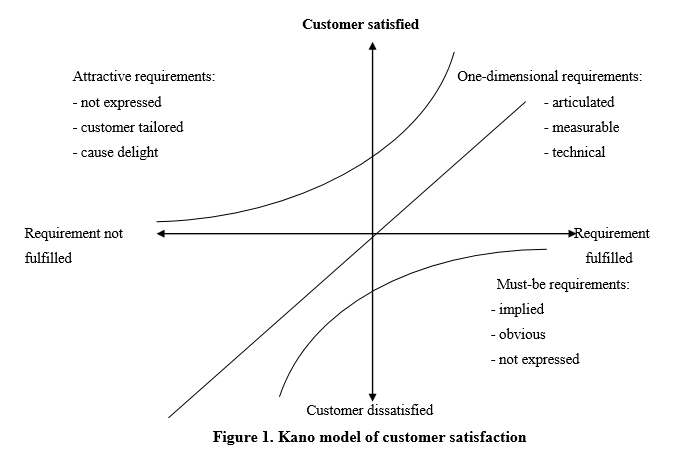 Scholarly Articles » Kano model: how to satisfy customers? Kano model: how to satisfy customers? This paper presents how service or product requirements can be analysed by using Kano model and discusses the potential benefits that can be achieved by applying this approach to skis industry. According to the Kano model, service/product features chould be classified into three classes depending on their ability to create customer satisfaction or cause dissatisfaction: must-be, one-dimensional and attractive requirements. This study suggests that Kano model can to identify the most important customer service/product elements, and to distinguish the differences between customer groups. Which products and services can be used to achieve the highest level of customer satisfaction? What are the characteristics of the product that lead to customer satisfaction and which product features seem to be necessary for customer? So far customer satisfaction was seen as one-dimension interpretation – the higher the perceived quality of the product, the higher the customers satisfaction is and vice versa. However, individual product requirements (features) which provide a lot of satisfaction may not always mean a high level of customer satisfaction. The aim of the paper is to investigate a detailed description of the Kano model and to analyse what helps to clarify the essential service requirements (attributes), leading to customer satisfaction. must-be requirements (features); if these conditions (requirements) are not met and do not perform the basic functions, the customer will be extremely unhappy. The must-be requirements are the main criteria of the product/service. In most cases, this is a crucial competitive and if they do not provide much satisfaction, the customer will not be interested in product at all. Antony and Preece (2002) presents a model to meet these requirements: as a must-be requirement for banks may be courtesy of staff, the services offered by carriers – passenger and driver safety. In product case, this could be the S-class vehicles equipped with air bags (Raab et al., 2008). one-dimensional requirements (features); according to these requirements, customer satisfaction is proportional to the needs of the level – the higher the satisfaction level is, the higher the customer’s satisfaction is and vice versa. One-dimensional requirements – a clear customer’s requirements. As one possible example of this can be the waiting time at the bank. attractive requirements (features); these requirements are based on the evaluation of the product, which is mainly determined by what level the customer will be satisfied with a product. Attractive requirements are neither urgent nor expected by the customer. As Webber and Wallance (2007) complete these findings, if any organization is able to provide the must-be and onedimensional requirements, and yet these characteristics, it is lively, unexpected and challenging, then that organization has a high chance of great joy and delight customers by the products/services, or even to distinguish from competitors and grab to their side. In other words, Antony and Preece (2002) simply say that this is what customers expect, has requested direct service providers, vendors, however receive and mostly remain so surprised, both together and meet. All three types of requirements can be seen in a Figure 1 (Sauerwein et al., 1996). Priority of the evolution of its development. For example, to invest improvements to the must-be requirements are not very useful, because they are already in the satisfaction level. It would be better to improve one-dimensional or attractive requirements, because these requirements are increasingly based on perceived product quality and customer satisfaction levels. Product requirements are better to understand: the classification of the requirements into must-be, one-dimensional and attractive helps better to understand of what leads to customer satisfaction. Kano model is used to determine the individual characteristics of the importance of customer satisfaction. Thus creating the necessary conditions of optimal, focused on product development and its evolution. Must-be, one-dimensional and attractive requirements are different, because their performance is expected from the different customer segments. Kano model promotes understanding of the product or service requirements. You can identify the factors which have the greatest impact on customer satisfaction. If two product features cannot be improved for technical or financial reasons, a feature which has greater impact on user satisfaction can be found in the Kano model. Attractive product requirements are the major key to competitiveness in the market. Summarizing the main advantages of Kano model show that it can determine certain product/service features that help to achieve the highest customer satisfaction level. Only after establishing product/service features that provide customer satisfaction it is possible to achieve effective outcomes. Kano model makes it possible to highlight a wide range attractive, appealing service/product features. Below is an example of how product requirements are classified according to the values questionnaire (survey). Ski industry, where customers were surveyed in 1500, will show how a set of product requirements for the building of the survey (questionnaire) as assessed and the results are interpreted and used as the basis for product development, improvement. The ski industry case is presented because it most accurately describes essence of Kano model. Of course, there was found other studies cases where Kano model is used: Kano model for investigation of student satisfaction with university in Turkey (Bilgili and Unal, 2008), Kano model for analyzing the use of innovative, new products/services to market (Shen et al., 2000), and Tan and Pawitra (2001) Kano model combines with service quality SERVQUAL measurement method. Which associations does the customer make when using the product X? What kind of problems/defects does the customer associate with the use of the product X? Which criteria does the customer take into consideration when buying the product X? Which new features or services would better meet the expectations of the customer? What would the customer change in the product X? Xu et al. (2008) argued that the first step to identify specific product requirements is a useful tool that helps to classify and to identify customer preferences. It also helps to determine how they affect customer satisfaction with product/service. At this moment non-linear relationship between product characteristics and customer satisfaction is found. Step 2: Construction of the Kano model questionnaire. The Kano model survey is constructed and later carried out using the surveys of customers. A questionnaire has a group of two questions for each attribute. Then each pair of questions includes a functional form (a product has characteristic, feature), and dysfunctional question form (a product doesn`t have characteristic, feature) (Berger et al., 1993) (see Figure 2). Must-be, one-dimensional and attractive product requirements, as well as product requirements of the customer indifference, can be classified according to the questionnaire values. Each product characteristic is formulated as a couple of questions that customer may respond to one of five different options. The first question concerns the reaction of the customer benefits of the product characteristics, whether the product has the feature (functional form of the question – practical, useful), and the second question relates to the customer`s reaction if the product does not have this feature (dysfunctional form of the question – confused, spoiled). Next evaluation table (see Figure 3) shows the characteristics of the product, according to concerted two responses, which may be classified. If the customer to question “If the edges of your skis grip well on hard snow, how do you feel?” responses “I like it that way” – functional form of the question. Replies “I am neutral“ or „I can live with it that way“ because „If the edges of your skis do not grip well on hard snow, how do you feel?“ – dysfunctional form of the question. Berger et al. (1993), in this case, the combination of questions simply explain as follows: the first question is formulated „If [product/service] has [property/requirement/feature X], how do you feel?“; the second question is formulated „If [product/service] does not have [property/requirement/feature X], how do you feel?“. Sauerwein et al. (1996) show that the combination of the questions in the evaluation table produces category A. This indicates that edge grip is an attractive customer requirement, it is a necessary condition. Category I means that the customer is indifferent to this product feature. He/she does not care about the product feature, or feature is missing. Category Q is a questionable result. Usually the answers in this category do not access. Questionable score means that the question was phrased incorrectly, or that the person interviewed did not understand the question or the wrong answer was selected by mistake. R category means that the product feature is not only wanted by the customer but he/she even expects the reverse. For example, when offering holiday tours, a certain customer segment willing to pre-planned events every day, but other users may not like it, because they want to plan their own personal events. In addition to the Kano questionnaire, it might be helpful to have the customer rank the individual product criteria of the current product and to determine the relative importance of the individual product criteria (see Figure 4). In conclusion, such Kano model survey design with a set of evaluation criteria can help to establish product/service priorities, its development and improvements. Step 3: Implementation of the customer survey. Customers are well aware of its present and future needs. In most cases, the company while doing market research, makes a big mistake, simply interviews with its customers, from which you find useful information about their needs and desires. Companies from the customer can expect only what is currently offered in the market. However, customers have always been a great help for companies to evaluate a new concept or idea (Gustafsson et al., 1999). In summary, any organization which wants to continue their business successfully and profitably they need to conduct a market study. And only weel-thought which survey method or approach may be the most appropriate way to begin an investigation. Step 4: Analysis and interpretation. The questionnaire is analysed in three steps. After combined functional (positive) and dysfunctional (negative) question’s answers (see Figure 3), each service criteria are summarized in the table of results, which show the overall distribution. The next step is the results analysis and interpretation. Below Figure 5 is presented and it shows the example of individual requirements for the product (in this case, ski). The easiest way for the results interpretation is analysis, which is based on the response rate of recurrence. In this case, for example, by analyzing the model with the skis, edge grip would be a must-be requirement (49.3%), ease of turn a one-dimensional requirement (45.1%) and service of edges and base an attractive requirement (63.8%). If the questionnaire includes sufficient customer – oriented variables, the results can be used as an ideal basis for marketing segmentation and thus differentiation of products/services according to different customer segments. Given the overall integrity of the results the formula: M>O>A>I. When decisions are made on the products/services development and so on, in particular, those features, properties must be considered, discussed, since it can have a significant impact on perceived product/service quality. The customer satisfaction coefficient indicates how much the service or product features and properties may lead to customer satisfaction or vice versa – frustration/dissatisfaction. Summing up the average satisfaction with the impact, influence, it must be to add attractive, onedimensional column and the divide by the total attractive, one-dimensional, must-be and indifferent responses. To calculate the average impact on dissatisfaction it should add the must-be and onedimensional columns and then divide by the same factors. In this case, the minus sign is placed in a formula to emphasize its negative impact on customer satisfaction if this product quality is not fulfilled. Satisfaction with the positive values included in the scope from 0 to 1. If the value is closer to 1, the impact of customer satisfaction is greater; positive coefficient, which approaches the value 0 indicates that there is very little impact, importance. However, it is important to see negative satisfaction values too. If the value is approaching towards -1, customer dissatisfaction is very strong; size, approximately equal to 0, meaning that a certain property does not feature such a high level of dissatisfaction. Sauerwein et al. (1996) make the following conclusion: it is necessary to fill out and to fully understand must-be service features, characteristics, one-dimensional features to isolate from the rest exciting, challenging and unexpected (attractive) properties of all possible advantages and positive features. Reviewing and summarizing all the Kano model, Berger et al. (1993) conclude that the customer satisfaction evaluation method is perfect, in their words „brilliant“, but even this model still has more or less failures and shortcomings. One of them – the answers wording to the questions must be made very carefully and thoroughly. Second, a survey about service characteristics can help in implementing new ideas, but do not forget that different people have different approaches and service features and other elements, so even the Kano survey have difficulty determining what it is to improve service and customer satisfaction in them. Webber and Wallace (2007) add that the analysis of data should be careful of the selection size – the smaller the selection is, the chance of many mistakes becomes bigger. Thus, assessed the researchers experiences and views on the Kano customer satisfaction method, I can make my own conclusions and evaluate that this model has both: advantages and disadvantages. Although the method requires extremely high levels of due diligence and experience, or a questionnaire may seem confusing, but this approach can help to identify the key features of product/service, which has a significant impact on customer satisfaction. Also, this method can help to identify the product/service features for which customers have problem and hence the dissatisfaction with the service/product. Determining these defects, when resolving and improving, developing product/services features, customer satisfaction level will rise. Antony J., Preece D. (2002). Understanding, Managing and Implementing Quality. Frameworks, techniques and cases. London and New York: Routledge. Berger C., Blauth R., Boger D., Bolster C., Burchill G., DuMouchel W., Pouliot F., Richter R., Rubinoff A., Shen D., Timko M., Walden D. (1993). Kano’s methods for understanding customer-defined quality. The Center for Quality Management Journal, Vol. 2 No. 4, p. 2-36. Bilgili B., Unal S. (2008). Kano Model Application for Classifying the Requirements of University Students. Available at: http://mibes.teilar.gr/conferences/MMIBES_CD_2008/ORAL/Bilgili_Unal.pdf. Gustafsson A., Ekdahl F., Edvardsson B. (1999). Customer focused service development in practise. A case study at Scandinavian Airlines System (SAS). International Journal of Service Industry Management, Vol. 10 No. 4, p. 344-358. Matzler K., Hinterburger H. (1998). How to make product development projects more successful by integrating Kano’s model of customer satisfaction into quality function deployment. Available at: http://www.hinterhuber.com/uploads/articles/strategy/New_product_development_Kano_cust_satisfaction_Technovatio n.pdf. Raab G., Ajami A. R., Gargeya B. V., Goddard J. G. (2008). Customer Relationship Management. A Global Perspective. Great Britain: Gower Publishing Limited. ReVelle J. B., Moran J. W., Cox Ch. A. (1998). The QFD Handbook. Canada: John Wiley & Sons Inc.
Sauerwein E., Bailom F., Matzler K., Hinterburger H. (1996). The Kano Model: How to delight your customers. Available at: http://faculty.kfupm.edu.sa/CEM/bushait/CEM_515-082/kano/kano-model2.pdf. Shen X., Tan K., Xie M. (2000). An integrated approach to innovative product development using Kano’s model and QFD. European Journal of Innovation Management, Vol. 3, No. 2, p. 91-99. Tan K., Pawitra T. (2001). Integrating SERVQUAL and Kano’s model into QFD for service axcellence development. Managing Service Quality, Vo. 11, No. 6, p. 418-430. Webber L., Wallace M. (2007). Quality control for dummies. United States: Wiley Publishing. Xu Q., Jiao J. R., Yang X., Helander M. (2008). An analytical Kano model for customer need analysis. Design Studies, No. 30, p. 87-110.